Start the tool from the command line with mlnquery. The MLN query tool is an interface to make inferences in a Markov logic network. The tool allows you to invoke the actual MLN inference algorithms of the MLN engine. Once you start the actual algorithm, the tool window itself will be hidden as long as the job is running, while the output of the algorithm is written to the console for you to follow. At the beginning, the tools list the main input parameters for your convenience, and, at the end, the query tool additionally outputs the inference results to the console. 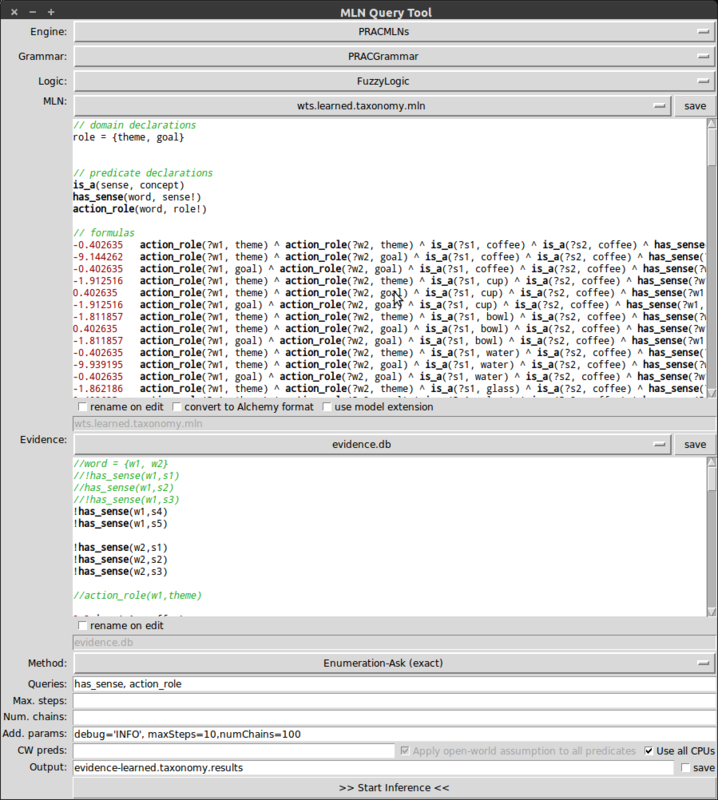 The tool features integrated editors for .db and .mln files. If you modify a file in the internal editor, it will automatically be saved as soon as you invoke the learning or inference method. The new content can either be saved to the same file (overwriting the old content) or a new file, which you can choose to name as desired. Furthermore, the tool will save all the settings you made whenever the inference method is invoked, so that you can easily resume a session. When performing inference, one typically associates a particular query with each evidence database, so the query tool specifically remembers the query you made for each evidence database and restores it whenever you change back to the evidence database. CW Preds: A comma-separated list of predicate names, whose atom values are automatically set to false if evidence does not state something different. Fore functionally determined perdicates, this settings will raise an exception, because there must always be exactly one true ground atom. CW assumption: Will apply the closed-world assumption to all predicates that do not appear in the list of queries. This setting will have no effect on functional predicates and will print a warning for soft-functional predicates. the option to show additional debug outputs during the execution when using the internal system (additional parameter: debug='INFO'). This field can also be used to pass additional, method-specific parameters to the algorithm, which are documented in Inference Methods.